Sheldon Adelson told CNNMoney he has no "personal interest" in the Las Vegas Review-Journal, although Fortune magazine says he is the primary owner. "I have no personal interest" in the Las Vegas Review-Journal, billionaire casino mogul Sheldon Adelson said Tuesday night, in his first public comments about the mysterious sale of Nevada's biggest newspaper. Speaking with me on the sidelines of the CNN debate, Adelson batted away speculation that he is one of the new owners of the newspaper. He repeatedly indicated that he is not. He seemed to be enjoying the guessing game. On Wednesday, however, Fortune magazine reported that Adelson is the "primary buyer" of the paper, which changed hands last week in a secretive $140 million deal. Fortune cited "multiple sources familiar with the situation." 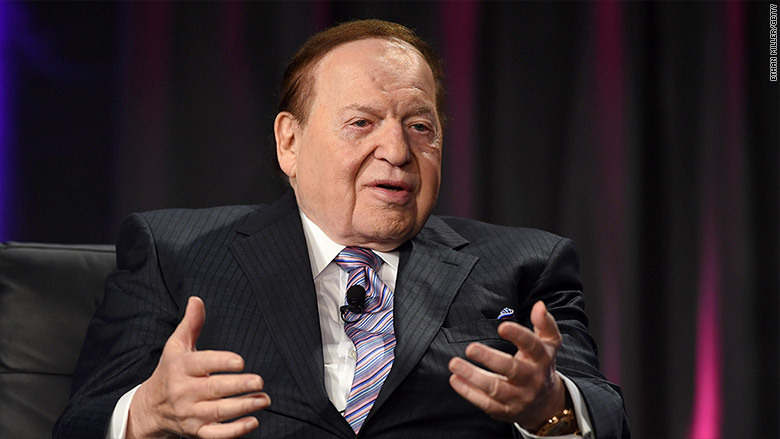 An Adelson spokesman did not respond to a request for further comment on Wednesday afternoon. Adelson, the owner of the Venetian Las Vegas, is a major power broker in the city and a major benefactor of Republican campaigns across the country. He and his representatives have been tight-lipped ever since the Review-Journal sale was announced last Thursday. Newsroom staffers were told that the new owners were choosing to remain anonymous. The arrangement has created a great deal of concern behind the scenes, and media experts cannot recall a similarly secretive purchase of a major daily paper in recent decades. Adelson's name came up as a possible buyer right away. He already owns a daily newspaper in Israel "that he uses to wield political influence," veteran Nevada columnist Jon Ralston said on Sunday's "Reliable Sources." "I know there had been talks inside Sheldon Adelson's inner circle about purchasing a newspaper" in the United States, Ralston added. Reporters inside the newspaper have been pursuing evidence that Adelson is involved in the sale. He was in the audience at CNN's GOP debate -- held inside the Venetian Theatre that he owns -- so I approached him during a commercial break. Adelson initially smiled and said "no comment" when I asked about the Review-Journal. Then I pressed for a yes or no answer about whether he is an investor in the paper. I thought his bodyguard might shoo me away. But he seemed happy to talk. He repeatedly said "no," saying at one point, "I have no personal interest," which made me wonder if he was leaving some wiggle room in his answer. Could he be involved through intermediaries? As we spoke, he acknowledged with amusement that his name has been bandied about. "Everyone thinks it's either me or Steve Wynn," Adelson said. So is it his rival casino owner Wynn? "It could be," he said. Adelson also wondered aloud about why the sale was getting so much attention, since, as he put it, "there are hundreds of local daily papers." I responded that the newsroom staffers don't know who they're working for. Then it was time for the debate to resume. On Wednesday, a Nevada congresswoman who represents the Las Vegas area, Rep. Dina Titus, said in a floor speech, "It's time for the new owners to take off their mask and prove they have nothing to hide."